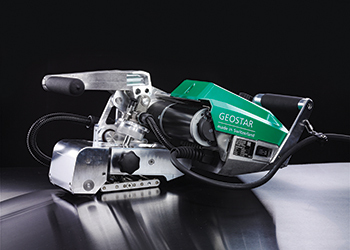 Leister is setting new standards in geomembrane welding with its ‘faster, lighter and smarter’ Geostar welder. “The introduction of Geostar for welding geomembranes marks the appearance of a hot wedge welding machine perfected for civil engineering that redefines state-of-the-art technology,” says Syed Owais, sales manager-Abu Dhabi for Dubai-based BMC Gulf, Leister’s sales and service partner in the UAE. Geostar can expedite jobs in various applications such as wastewater ponds, waterproofing of building basements, landfills, mines and other projects that require sealing through geomembranes while enabling a better control over quality parameters. The compact, cast aluminium frame construction of the unit offers maximum performance for the hardest applications. “With heating capacity/heating power of up to 2,500 Watts, peak welding speeds of up to 12 m per minute can be achieved. Geostar’s height-adjustable chassis can handle any terrain without difficulty,” Owais points out. “The digital operating unit (eDrive) with integrated display permits permanent monitoring of all the key weld parameters (heat, speed, pressure and voltage) during the work process,” adds Rachid Benlakhouy, sales manager Africa and Middle East at Leister. This sleek new design makes field servicing a cinch – the wedge can be removed and replaced in under a minute, he explains. Additional features include easy loading of material, natural flow of material through the machine, integrated clamping grip engagement, innovative ergonomics that allow one-hand operation and three different parking and maintenance positions. Geostar will be officially launched during GeoME 2015, the seventh Geosynthetics Middle East international conference to be held in Abu Dhabi, UAE, this month (November 16 and 17). “Leister will present this new innovation during workshops to an audience of geotechnical and environment specialists,” says Owais. Switzerland-headquartered Leister Technologies is a worldwide market leader offering plastic welding tools and hot-air solutions. Its plastic welding tools are used in roofing, billboards, tarpaulins, civil engineering, tunnelling, landfills, plastic fabrication, flooring, and shrinking, to name a few.